Everything You Want & Plenty of It! These next-generation autoflowering seeds are extremely strong, very generous, totally delicious, freaky fast, and simple enough for untrained monkeys. It's a super-stoned win-win-win-win with every click. Get yours today or kick yourself for missing out! Why Compromise? Buy These Wicked-Good Autos Today & Have It All! Big & Strong - Stunning! 8 Weeks Is All Critical Needs! When done, this White Dwarf X Critical Mass hybrid will rock your world with enough THC to fry Einstein's brain. How'd you think he came up with that freaky theory of relativity? Very Stealthy with XXXL Yields - You'll Love This One! Versatile & Fast - 15% THC! Put these Autos anywhere & in anything & they'll still do their thing in just 75 days or less from seed with up to 400 gr/m2 in yield! How Do You Make It to the Top of the Gorilla Seedbank? Climb! Climb! Climb! Unless you're a High Performance Auto Seed. The Gorilla loves these little monsters so much he scales the highest peaks of the Gorilla Seeds warehouse doing his best King Kong impression & gently places them on the roof before he swats away those swarming UFO's - f'ing greedy alien bastards! Extra Fast & Very Tasty! In addition to high THC & equally high yields, Blue Treacle Automatic Feminized is so sweet & delicious she'll practically rot your teeth. Put your dentist on speed dial & fully enjoy this Blueberry X Sweet Tooth hybrid by Feminised Seeds! Next on the High THC/High Yield Auto List is Pyramid Seeds Auto Super Hash. This powerhouse has a full 17% THC, massive 550 gr/m2 yields & the thickest resin we've ever seen on a fully autoflowering cannabis seed. And get this - she only needs 55 days total! 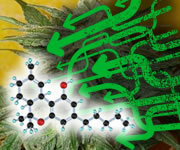 These High THC/High Yield Weed Seeds Will Treat You Right - Buy 'em Now!